Your college pillows are as much a part of your dorm room decor as the rest of your Twin XL Bedding. You don't want to hide your dorm pillows under your Twin XL Comforter. Not only will that take away from some of the great dorm room decorations you could be adding to your dorm room decor, it will also take away some of that comforting look that will relax you when you come back to your dorm room after a long day. Display your college pillows and make them a part of your dorm room decor with our College Pillowcases - Arrows. 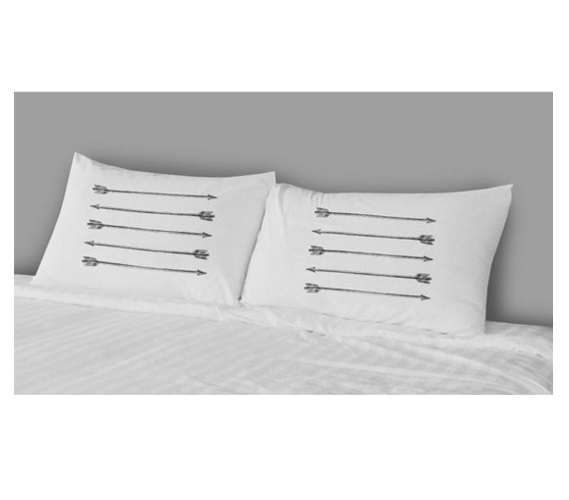 This dorm essentials pack comes with two college pillowcases with lightly sketched arrows on a white backdrop. This unique design will allow you to mix and match with your dorm room decorations and Twin XL Bedding easily without worrying about any of your designs and color themes clashing. While adding to your dorm room decor is pretty important, adding extra comfort to your Extra Long Twin Bedding is too. These dorm necessities have great style, but they're also pretty comfy! Each dorm pillowcase is made of 100% Cotton so you get the super soft touch of cotton beneath your head and all of the positive natural properties of cotton too!